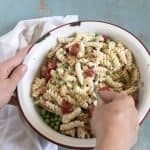 Chicken Bacon Ranch Pasta Salad is our favorite pasta salad recipe that comes together in about 20 minutes, and the whole family loves it. Long live super easy, quick, and tasty dinners all summer long. Let’s be honest, summering is fun but it’s tiring (I know I’m not the only mama who’s exhausted by dinnertime). 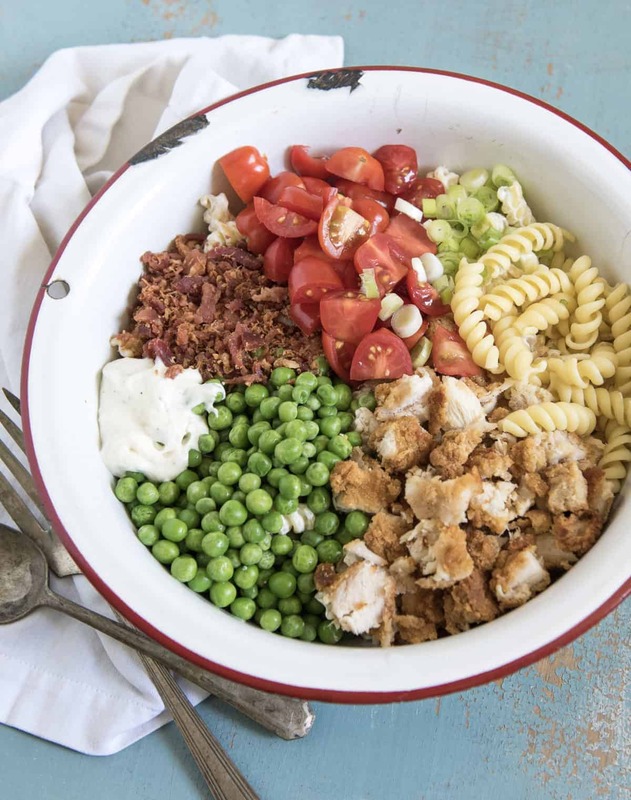 This Chicken Bacon Pasta Salad is our favorite pasta salad recipe that comes together in about 20 minutes and the whole family loves it. It’s kind of a one pot meal because it has your pasta, some veggies, and a little protein all in one bowl, which means that you only need to slice a little watermelon to go on the side and dinner is done. Bonus points if you grill up some zucchini to go with it. 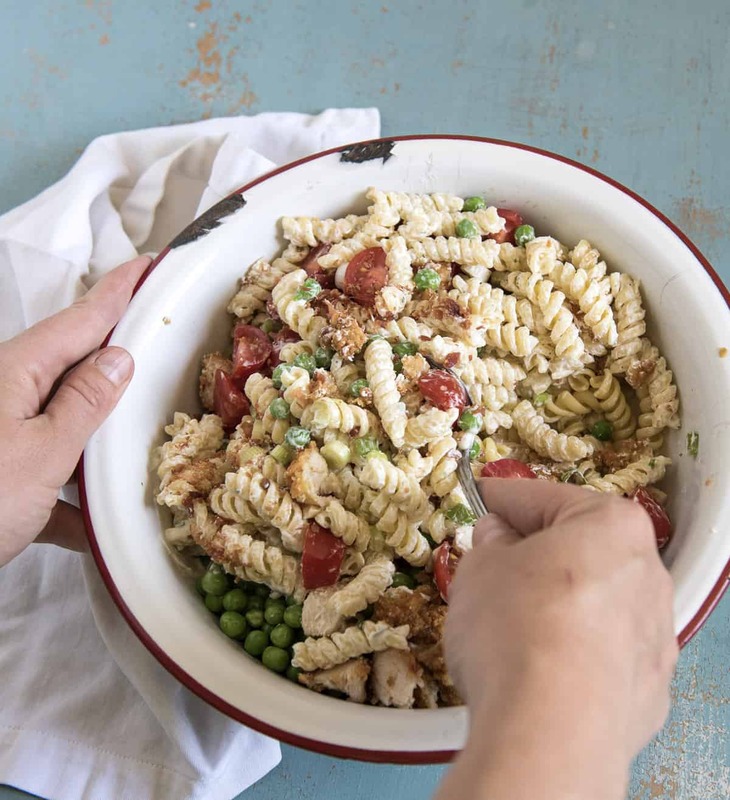 Let’s give three cheers for pasta, peas, bacon, chicken, fresh tomatoes, and just the right amount of creamy sauce that all come together to make the most delicious creamy pasta salad that is just perfect for a simple summer dinner. We love eating outside while the weather is so warm and nice, and I can’t wait until our house is done so that we can sit on our back deck and enjoy our view. Use whatever chicken you like/have. I cooked up some crispy chicken strips for this batch of pasta salad and it was so good (and so easy!). You can use leftover rotisserie chicken, grilled chicken, or just about any other kind that you like or have. To save time, prep your chicken ahead of time on your meal prep day. This dish will serve 4 as a main dish or 6-8 as a side. This makes a great side to take to any party, picnic, or cookout! It’s great with steak, grilled corn and avocado salad, and just about any other summer food you’d like. If you are making this ahead of time, save half of the dressing and stir it in right before serving. Are you in love with my enamelware bowl? I just got a few new ones too (the vintage ones are hard to find here). 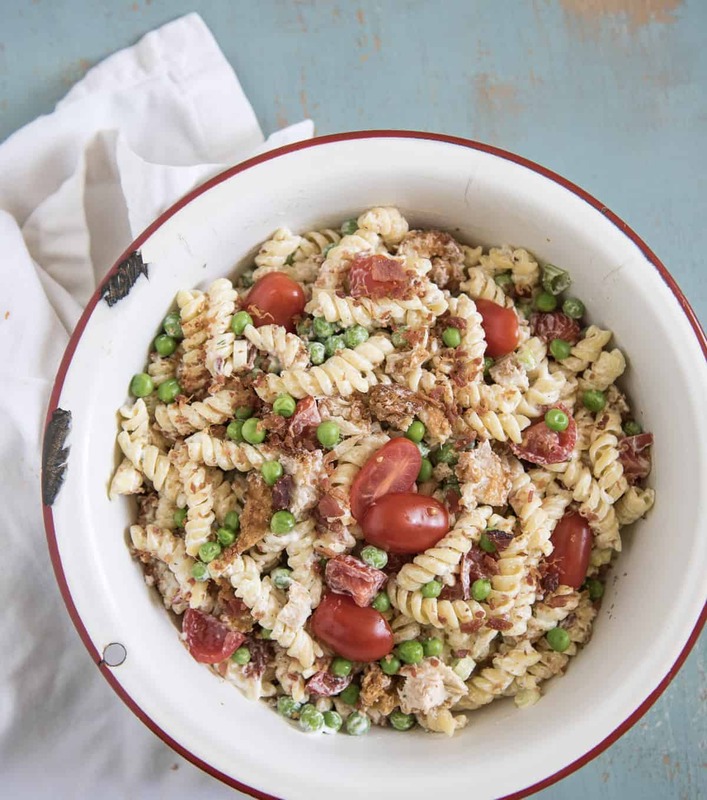 Chicken Bacon Pasta Salad is our favorite pasta salad recipe that comes together in about 20 minutes, and the whole family loves it. Cook the pasta according to package directions until it is cooked al dente. Drain and rinse in cold water. Add the peas, cooked chicken, bacon, tomato and onion to the pasta. In a small bowl, combine the mayonnaise, sour cream, and ranch seasoning and stir to combine. Add to the pasta. Stir everything together until it is all well-coated. Add salt and pepper to taste. Serve right away. Use whatever type of chicken you have. Grilled chicken breast, rotisserie chicken, or even crispy chicken strips from the freezer section will work here. Chicken Bacon Ranch Pasta Salad is one of my all-time favorite dinners to serve all summer long because my family loves it, it’s super easy to make, and it comes together quickly. I know you are going to love this one as much as we do. 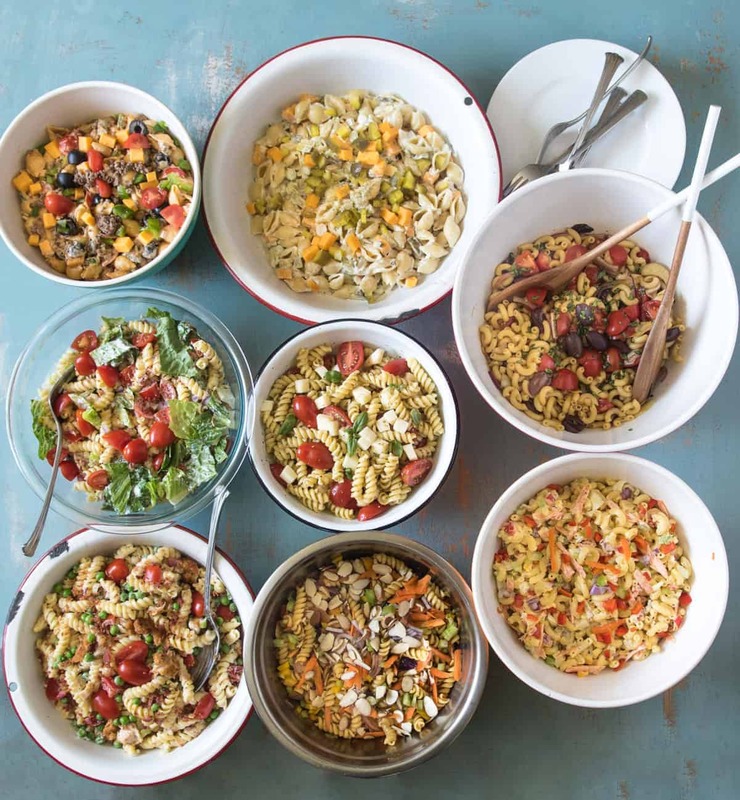 Be on the lookout for a whole lotta pasta salad recipes coming your way. Enjoy from my home to yours! I agree with you about summer – it’s fun (yay! for longer sunny days), but I get so tired by dinner. This pasta salad looks so delicious and I love that it comes together so fast and it’s easy! My kind of meal! I could eat this beautiful salad for any meal of the day! Outstanding combination of flavors and so pretty too!